Don't you want a job already? Well it helps to know what employers are looking for. You can list all of the softwares and other technical skills you know. Aka "hard skills." And employers will be interested enough to interview you. But you go into the interview process and don't land the job. 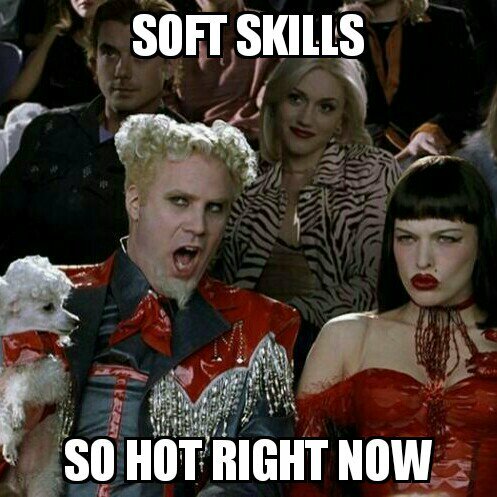 Well, they liked your hard skills but your "soft skills" were not up to par. The interview is really the test of your soft skills. Wouldn't it be helpful to know some of the soft skills they are looking for? In my opinion, any list that doesn’t have communication skills at the top isn’t worth reading. This encompasses written and verbal as well as the ability to listen effectively. Tech is becoming increasingly automated. If you are able to differentiate yourself from the competition based on your communication, you will be in a good position to succeed. Companies need to trust that you will be able to effectively communicate with customers (if you're in a customer-facing role). Find out which communication tactics work and mold them to fit your personality. I believe this is one of the most important skills for people in tech, and more specifically sales, to have in their tool belt. It is defined as “the capacity to be aware of, control, and express one’s emotions, and to handle interpersonal relationships judiciously and empathetically.” The root of this skill is in psychology as well as your ability to communicate with people. Often times, people in tech will be more focused on their goals and aspirations while ignoring the customer’s. This approach generally tends to fail because the salesperson is unable to know which buttons to press and when. Having empathy for a customer is also a core foundation for building trust and therefore a successful business partnership. Persuasion technically could be under the umbrella of communication. But I do think it deserves its own category. Mastering persuasion is crucial not only for salespeople. Marketers want to “persuade" their audience to be interested in the product. Anyone championing a new product or system needs to be able to persuade others to get them on board. It’s obviously a huge topic in sales. But everyone needs to know how to persuade other people. We have an in-person event that we occasionally do that is called “The Art of Persuasion." I hate to devalue my college degree but there was definitely a lot of information taught to me that will have absolutely no relevance to my professional career. That’s okay. I’m sure that happens with a lot of people. One thing that I am extremely grateful for is that Cal Poly really taught me how to learn things on my own. “Learn by doing” is the mantra and I definitely feel like the school embodies it. Why is it important to be able to learn things quickly and without the help of others? Well, it prevents companies from devoting a lot of resources to help you learn something. Your potential as an employee is limitless if you can learn new things quickly without needing someone to hold your hand. -- Here are some other resources to help you in your job hunt: 3 Hardest Interview Questions (And How to Answer Them) Maximizing the Value of Each Line on Your Resume The online sales training videos on our Teachable will help you learn some sales skills as well as give you a preview of what our bootcamp training is like. And if you're asking yourself: "How can I find a boot camp near me?" You can learn sales skills online because our sales bootcamp is virtual.